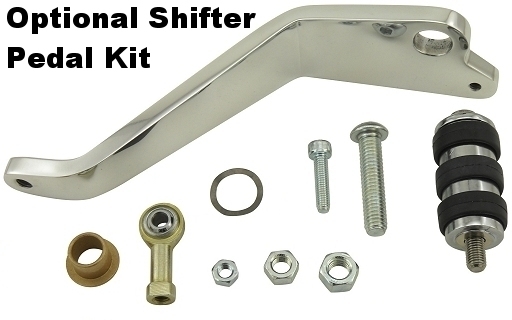 A billet aluminum forward control kit for Honda Shadow Spirit VT1100C 1997-2008 and Sabre VT1100C2 2000-2008. They move your controls forward 6" and 1" higher. Can be purchased WITH or WITHOUT foot pegs. 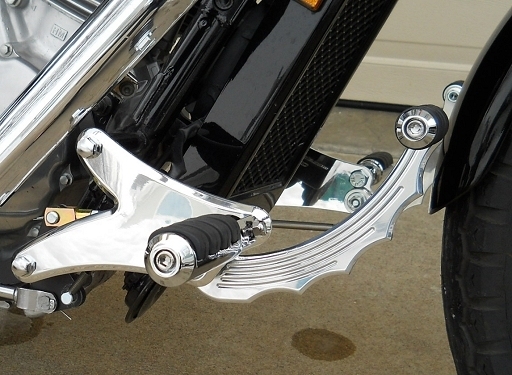 They mount on existing bolt locations on your frame so there's no need to drill any holes. The Basic kit, as shown above, uses your stock brake and shifter pedals OR you can add the optional Brake and Shifter Pedal kit shown below. This is a 1 hour or less, bolt on project. 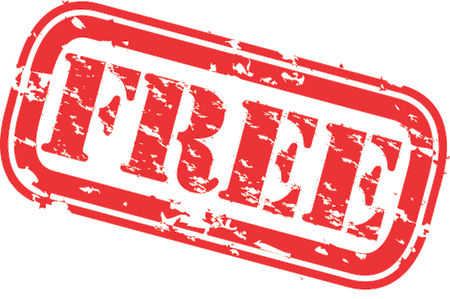 They do NOT require replacement or extension of the brake line. Installation does NOT require you to destroy any stock parts so installation is completely reversible. Forward controls will NOT work with most crash bars/case guards. If you have these types of guards they will probably have to be removed to install forward controls. 1. Using the stock brake and shifter pedals. This is the most econmical option. 2. Using your stock brake pedal but adding our BIGFOOT Shifter Pedal kit. This gives a lot more room for shifting if you wear a larger shoe size, but matches the stock brake pedal. 3. & 4. 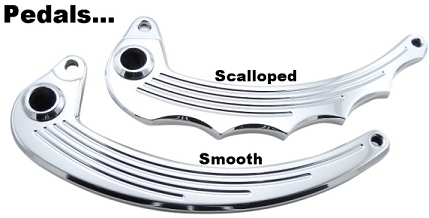 Using either our Scalloped or Smooth Brake AND Shifter Pedal kit. This gives an upgraded look and feel and matches the forward controls better. It works with all foot sizes. 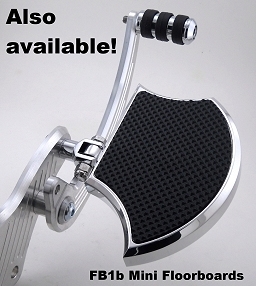 See OPTIONS below for our Brake and Shifter Pedal Upgrade Kit shown here! For use with the basic kit when more room is needed on the shifter side. Pedals include all necessary hardware. Stud mount pegs such as the Comfort, O-Ring and Spike only require a bolt to attach. 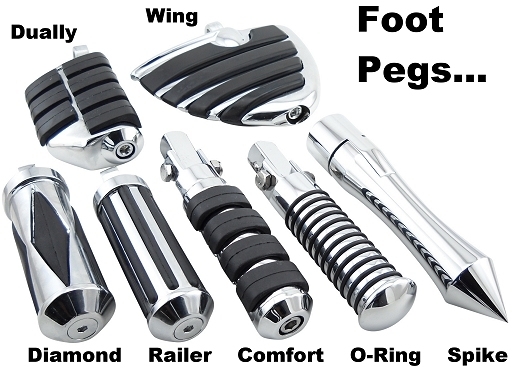 Male mount pegs such as the Diamond, Railer, Dually and Wing require a clevis adapter, sold separately.